Troop 50 held its first Court of Honor Monday evening as scouts and parents gathered to celebrate the first six months of the troop's accomplishments. The evening began with an excellent dinner of potluck items and chicken wings catered by Willie's Wings and Stuff. With the senior patrol leader Jake as emcee, the presentations began with merit badges earned during the troop's wilderness survival program in January and badges that were earned prior to the troop's formation at the end of last year. 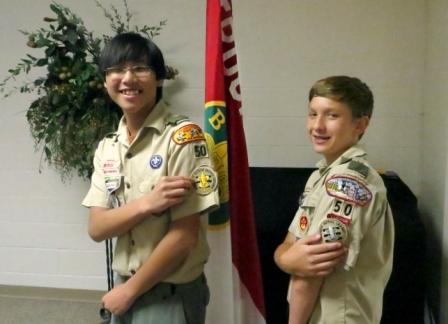 James Robert and Jeffery both earned their last Eagle-required merit badges and are now a step closer to scouting's highest rank. Seven scouts earned the Wilderness Survival merit badge. Our newest scouts were recognized for earning their scout badge, which was presented to them early last month. They were also given the patrol emblems for their new patrols. 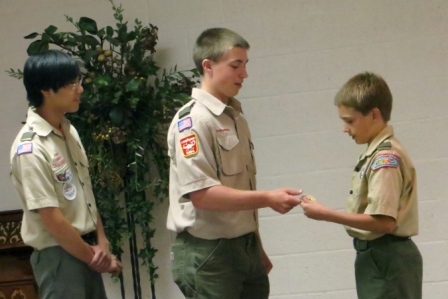 Josh, who joined the troop when it formed, was recognized for receiving his scout badge in March. It was a big night for Josh, who not only received his first merit badge, but was recognized as the first scout from Troop 50 to advance in rank. He was awarded his Tenderfoot rank by Jake, assisted by Troop Guide Vincent. It was noted that troop guides are instrumental in the life of a boy-led troop and that Vincent's mentoring of the younger scouts has been key to their advancement. Mr. Stanford and Mr. Baird took the opportunity to thank the members of the troop committee and the assistant scoutmasters for their contributions to the troop. Although Mr. Baird was recognized for receiving the William D. Boyce New-Unit Organizer Award, it was noted that numerous people contributed to the formation of Troop 50 and that the troop would not be successful without the continued assistance of adults who are willing to give their time and talents to scouting. Mr. Stanford recently received the District Award of Merit in recognition of the multiple roles he fills in the Saugahatchee District. His job as our troop committee chair is just one of the many ways he contributes to scouting overall. 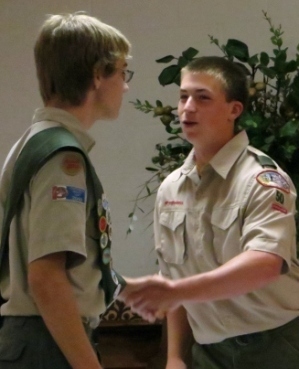 The last part of the program included the troop's first transfer of youth leadership. The outgoing senior patrol leader, Jake, and his assistant senior patrol leader, Ethan, were recognized for their exemplary work as the founding youth leaders of Troop 50. They were presented with framed patches that represented their positions as the first SPL and ASPL, in recognition of a job well done. The two of them stood by in support as their replacements, Andrew as SPL and Vincent as ASPL, were sworn in. Troop 50 has accomplished much in its brief tenure. Our meeting and outing programs have been fun and challenging. Our youth leadership has set the bar high for the future and our advancement program has enabled the scouts to succeed due to their own efforts. This summer we expect to have the first two Eagle Scouts from our troop and several more who begin their Eagle service projects. With a week at Camp Sequoyah, a Philmont expedition, and a couple of summer troop events; Troop 50 will continue to provide a quality program to the youth of our community. Click here for more photos from the Court of Honor.